Hint: Download the PDF facilitator guides for all 4 meetings at the end of this post. Most teams run status meetings because they always have. Because someone told them to. Because that’s what they did in their last job. Because the client asked for them. Just because that’s what you do. The result? Almost 50 percent of respondents in a recent poll said they would rather go to the DMV or watch paint dry than sit in a status meeting. Is this your team in a status meeting? For shame. Which reminds me of this old joke. “A more frightened than injured young electrician was brought into the hospital suffering from electrical burns. Shortly afterward his instructor, a chief electrician, arrived. “Why on earth didn’t you turn off the main power switch before you tried to splice the wires?” asked the chief. The status meeting is dead, long live the stand-up! So if most people hate them, why not just cancel all the status meetings? Lots of people have tried this, and that can work ok for some teams. 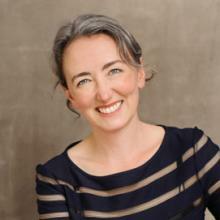 But more often, those teams run other meetings to fill in the gap: the team update, the individual check-ins, the stand-up – all basically synonymous with status meetings, but without the bad press. This happens because status meetings are actually really effective and efficient (yep, I said it!) at keeping a team informed and connected. In many situations, this is the absolute best way to keep a group on track IF you know why you’re meeting and how to do it well. With that in mind, here are 4 approaches to running remote team status meetings that work. Each one emphasizes different team values and work goals. Use any of them and you’ll get a project status meeting that sure beats the shiznit out of watching paint dry. Quick note: You’ll find meeting agenda templates for each of the meetings below in the Lucid Template Gallery. Our team tested each one before they hit the gallery, and while we definitely have our favorite, we find use for all of them in different situations. Each template includes a draft meeting agenda and detailed instructions for running these meetings. You'll need a Lucid account to download them, which you can get for free if you don't have one already. The agile stand-up became enormously popular as a core practice of software teams using an agile development methodology. Since then, it’s gained many names (daily Scrum meeting, daily meeting) and spread to other departments, who liked the fast, energetic pace. Short: Keep the meeting fast so people can get back to work. Frequent: Meet daily to make sure everyone has context for their work each day. Tactical: Focus on progress and what people are actually doing only, to encourage team accountability to each other and the plan. 15 minutes or less. The shorter, the better. Is there anything blocking your progress? The team may ask a few questions, and assign someone to help with a block raised during the meeting, but there should be no extended discussion. Fast, remember! At least, that’s one way to do it. There are many variations on the stand-up, which we’ll cover in another post. The team at Zapier runs a weekly meeting with echoes of the stand-up, but tuned to focus on questions and dialogue rather than listening to reports. Once each week, the team provides written status updates. At meeting time, everyone joins the call and reads through the updates together. While it may seem odd to get a bunch of people together to read in silence, this is actually a very efficient way to make sure everyone sees the updates. Most people read much faster than they talk, and many never bother to read written updates unless they have to. This silent reading moment ensures everyone read the updates and helps focus the group. Then, each person is given 5 minutes to ask questions about what they read. If a conversation goes long, those involved find a time to continue their discussion at another time. 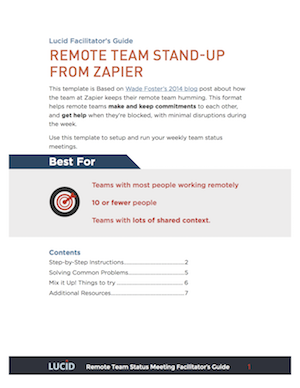 You can read full details on the Zapier blog post “How to Run a Remote Team Meeting”, now included as Chapter 7 in their Ultimate Guide to Remote Work. Initially designed as a written report format, and championed by the fine folks at WeekDone, this format changes up the core questions used in the agile stand-up to emphasize a more strategic viewpoint. 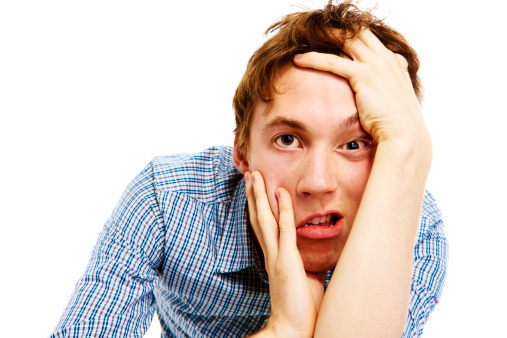 Problems: tasks you can’t finish because of blocks, dependencies, or lack of knowledge. The differences between this format and the agile format are subtle, but important. While you can answer these questions based on your personal work tasks (e.g., I made progress on this blog post, I plan to add pictures, etc. ), this meeting really works better when the questions are posed and answered at a more strategic level. During the meeting, the group walks through each update in turn. Because this meeting happens less frequently, the discussion can go on a bit longer than in other status meetings. Plan 30 minutes or less for internal teams that meet weekly, and up to 90 minutes (but no more!) when using this meeting to report out to investors each month. Time limits for each update are based on how many reports you have to cover in the allotted time. 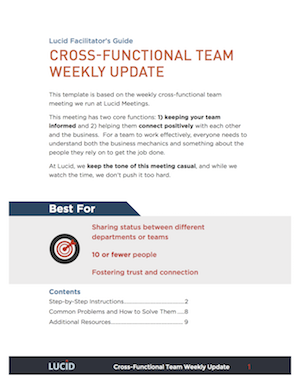 This weekly meeting agenda template is intended to bring together people working in the day-to-day business from different functional areas or departments. This meeting format includes agenda items about the company as a whole in addition to the individual reports. This meeting starts with a celebration of company achievements since the last meeting. These “Victories” might include new product launches, funding goals, successful events, new clients, milestones met - anything that specifically reinforces what successful progress on the mission looks like. Progress on commitments: How did you (and your team) do on the plans you committed to last time? Unexpected events: What came up that you didn’t anticipate? Plans: What are you (and your team) working on next? Problems: Where are you blocked and where do you need help? Personal: Is there anything non-work related you’d like to share? Did you keep your promises to the group? If not, why? How can we help? And what can we expect next? After the individual updates, the leaders then quickly review the key metrics: finances, close rates, whatever those key numbers might be that the group should know but that don’t really qualify as victories. This meeting requires a bit more prep from the people leading it, but doesn’t take any more prep time for individual participants than other approaches. So now it’s time to reflect. Why does your team hold status meetings? What purpose do they serve? Do you need to establish trust? Keep up with fast-changing development? While the essentials for each of these meeting formats are the same, how you ask the questions absolutely changes the answers you receive, and the impact the meeting has on your team. Whichever you choose, stay focused on why you picked that format, and be ready to change it up as your team and work evolve. 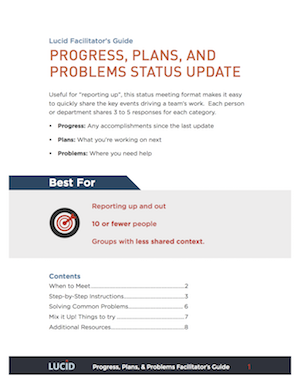 Want to run these meetings with your team with step-by-step instructions? Dowload a zip file with all 4 meeting facilitator guides.